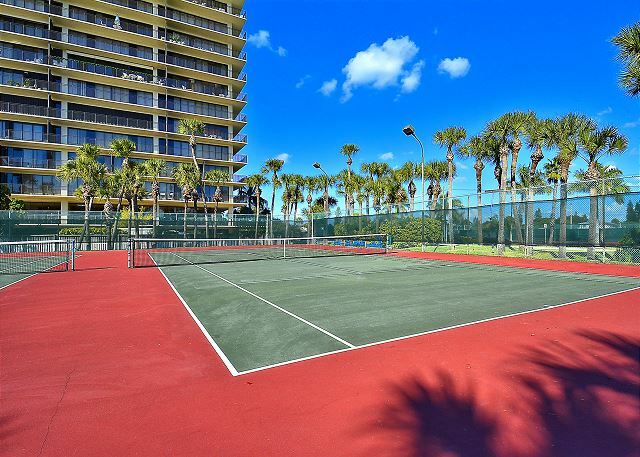 Entire condo completely renovated with new appliances and granite counters throughout. Recent upgrades include a new King size Bed with pillow top, 2 twin mattresses/box springs, sofa sleeper, 55" HD Smart TV and 2 32" HD TV's. Modern decor and a fully equipped kitchen allow you to relax and enjoy your time away from home. 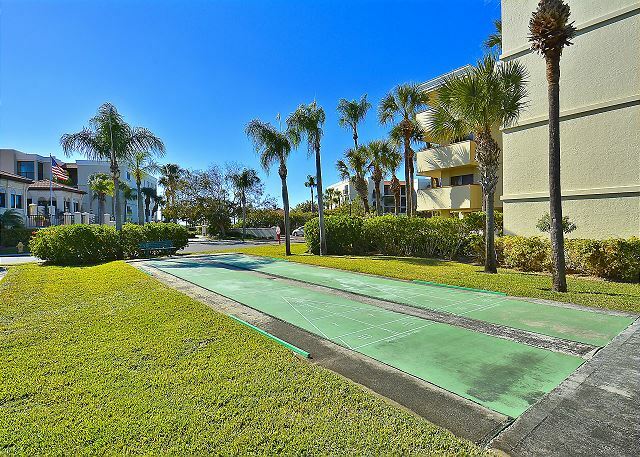 Located across from the pool on the east side of the property. 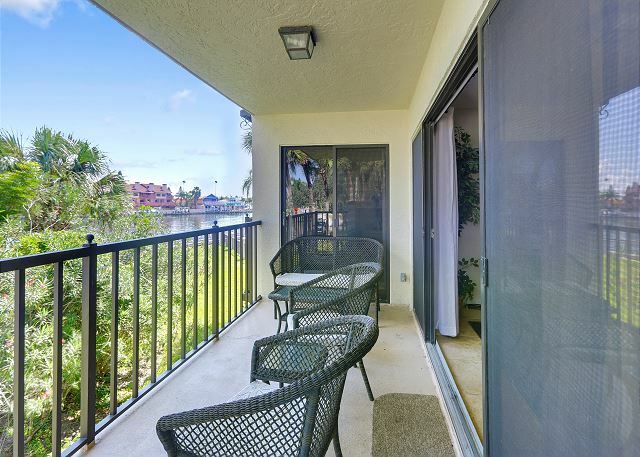 You may see dolphin, sea birds and boats on the water right outside our 2 balconies. Free wireless internet service. Lands End is, without a doubt, the best place to have an enjoyable, relaxing vacation. It's a hidden gem surrounded by incredible water views. Always look forward to returning. 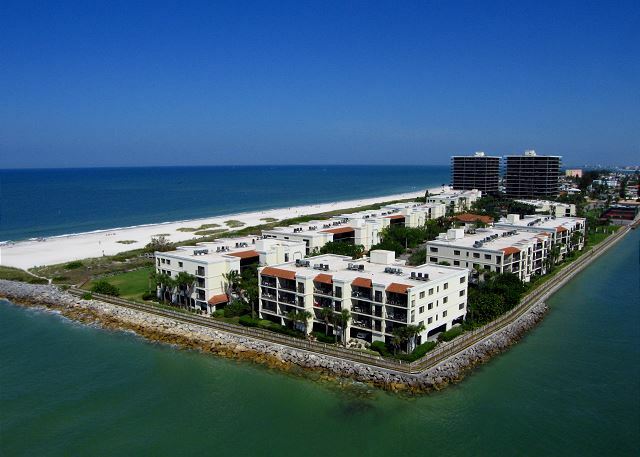 Resort Realty has great staff and very accommodating. Land's End location is ideal. Situated on sunset beach. Close to restaurants. Glad you enjoyed the location and we hope to have you back for future visits!! Our favorite unit. Very clean and updated. 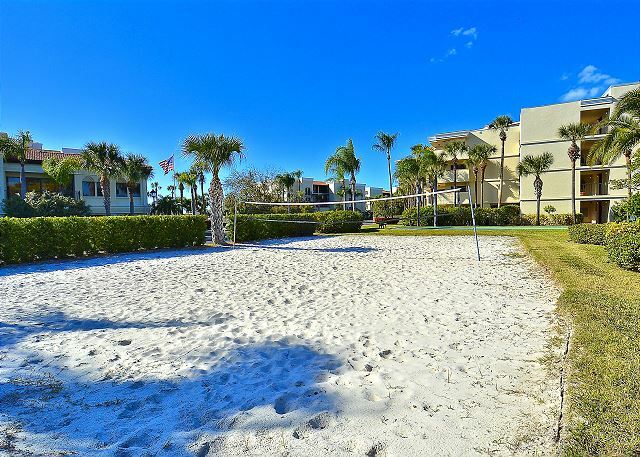 Quiet unit just a short walk to pool and beach. Lands End is a nice community located at the end of Sunset beach. Awesome!! Glad you found your favorite in this premier condo in building #1!! Thank you for staying with us and we look forward to your next visit! Resort Realty did a great job on their end. Maybe they should tell the managers of Lands End to enforce the rules rather then having hope, that they will. (reserving lounges chair at pool, opens at 8:00 am 1/3 of chairs have towels on them but no people???? 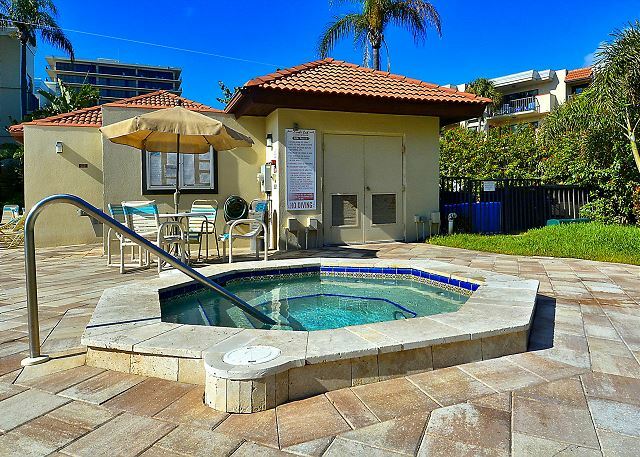 Lands End offers the perfect vacation in a comfortable and relaxing setting. As advertised, this condo was well equipped, up-to-date, clean, comfortable, and lacked nothing. The master bedroom and guest bedroom was spacious with more than ample closet space. The beds were very comfortable. Resort Rentals was very easy to find and check-in was a breeze. The young lady checking us in was very friendly, informative, and very enthusiastic to make our stay all that we hoped it would be. Fantastic!! It is your home away from home!! :-) Thank you so much for staying with us, we always enjoy having you and are looking forward to the next visit! a guest from Wauwatosa, WI does not recommend this vacation rental. The condo was very nice and perfect for our family. The proximity to the beach was awesome, and watching the doggies on the dog beach off of our deck was an added bonus. We saw manatee and dolphins, what a cool experience. One complaint is with the pool area. We have two children, ages 12 and 9, who love playing in the pool, however, we could not play with a ball in the pool which is weird and our kids were not welcome even "near" the hot tub, which was also really weird. And even if there was no one in the pool area or only a few others, somehow the security guard would find his way to the pool to ensure those "rules" were followed (basically there was someone watching the pool area, tattling on kids. I find that quite disturbing. Because of this, we will not rent here again, and will discourage anyone with a family to rent at Lands End. Very good condo. Good facilities and lovely beach and pool. Thank you for your post! This condo that you stayed in falls into our "premier" category of condos that carries recent updates and we are so glad you liked it!!! :-) The Land's End property as a whole is just lovely and very well maintained. Thank you for staying with us and we look forward to your next visit!! Lands End is a great place to stay. Rented here 4 times now and will define toy be back. Beautiful place for a family vacation! 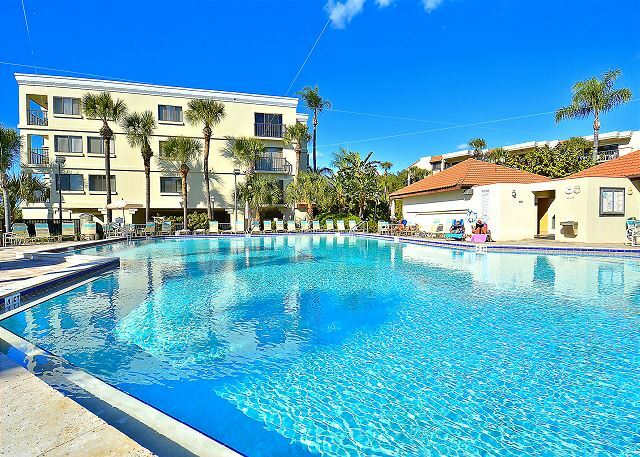 Big fully furnished condos, great view from the balcony, 2 minutes walk from the beach, 1 minute walk from the heated pool.... Our family loved everything about this place! Would definitely recommend to all my friends! Property was immaculate . This unit had an excellent view of the intercostal . Parking was accessible. Safe gated community. Our favorite was the pool and spa. Can't wait to return next year! Aside from problems with the elevator not working most of the week, everything was very enjoyable. Thanks for your reply. i do apologize for the issues you encountered with the elevator. I spoke with the property manager and it should all be under control now. Thanks again and we hope to see you next year. We had another wonderful vacation at Land's End. This is our fifth year of coming and we have always had a wonderful time. We hope to come for a month next year as two weeks aren't enough. For the most part this vacation rental was great. The location was wonderful, fabulous few, and the room itself was very nice. The only complaint was the fact that for the second year in a row the air unit for this building was not working properly. The temperature in the room stayed at about 77-78 degrees even with the thermostat set at 72. The room was clean except for dust build up on the bedroom furniture (dresser) but I really like the room itself. Thanks for your review! So sorry about the issues you encountered with the AC. I am showing that the issue has been resolved! I appreciate you letting us know about the problem. Hope to see you again soon! I hesitate to say how wonderful it was because I don't want the secret to get out! The condo was very nice and clean and in the perfect location! The pool was great and the beach perfect! I especially love the boardwalk allaround the property. We will definitely go back. I love this condo. We have been coming to Lands End now for five years and we stay in this condo each time. This condo is always decorated nicely. This year there are new beds in the second bedroom, which my daughter said were very comfortable. There are new sofas in the living room, with a pull out bed. There is also a new big tv in the living room. Lands End is always beautiful and clean. It's just far enough away from everything that you have quiet when you want it and close enough to everything that you can go out and have a good time. I can not wait until we come back next year. We will definitely stay in this condo again. My husband and I and our two adult children had a nice time staying at Lands End. The condo was clean and comfortable we especially liked the swimming pool and being right near the Ocean. The boardwalk was nice as well. We appreciated the security. We loved the location and the condo itself. The only draw back was that the place itself was not really kid friendly, more for mature adults. would stay again, in another unit. I have sent an emails outlining specific issues, and the positives, directly to your customer service person in the Agency. Thank you! All your comments are being addressed by the owner. We appreciate your feedback. Very nice vacation rental .. We are definitely returning next year . Perfect location for a family getaway! Many thanks to the owners for giving us the chance to live in unit 208 for our summer 2013 family of 5 vacation. 10 days to enjoy perfect beach, nice pool, play volleyball, all of that in a clean and beatiful environment. Unit was clean, functionnal and quiet. Everything we could need was there, beds were comfortable, kitchen well furnished... We will be back! We come here every year, wonderful place to stay definitely recommend it to friends and family! Lands End is a beautiful location. The condo was overlooking Blind Pass...a great place to watch the boats and dolphins go by. 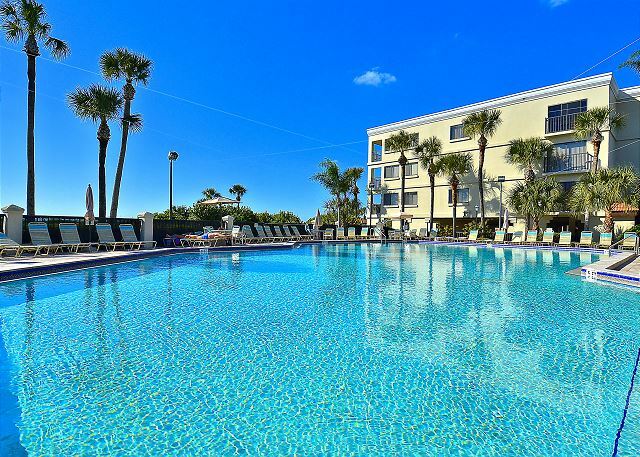 The beach and the pool could not be better. Resort Rentals especially Janet are very acommodating and helpful with all your needs before and during your stay. There should more dishes. We also had to asked Resort Rentals for more utensils and small containers. furthermore the shower attached to the 2nd bedroom did not work properly and Resort Rentals were notified. After 2 plumber visits the problem was resolved although during our son's visit he had to use our ensuite shower. Alongside my review you can leave my name as Jean L but correct Ottowa, it should be spelled Ottawa, which Canada's capital!! Thanks so much for the high ratings. We love when we get all 5's! Sorry about the issues you encountered while here. I am glad we were able to resolve them. Unfortunately the Ottawa typo can’t be fixed once it processes but I did change your file so it will be correct next time. Thanks again for the rave review. Hope to see you next year! Overall our stay at Land's End was very nice. The condo is nice and location is excellent. We were a little disappointed that there were no extra linens for the main bedroom and the water pressure in the bathtub of the main bathroom is very low.. There was no plastic spatula to use on the Teflon frying pans. Thanks so much for your review! Sorry about the sheets and spatula. Next time, if you are missing required items please do not hesitate to give us a call. We have most of the basic items here at our office and have no problem revisiting a property to make things right. Thanks again and we look forward to hosting your vacation in the future! ****UPDATE**** The water pressure issue in the main bath has been repaired! The unit we stayed in at Lands End was completed updated and beautifully decorated. The Lands End resort was fantastic and the representatives at Resort Rentals were great to work with. The property at Lands End was very well maintained and we felt very secure. The location was a plus also. We were minutes away from restaurants, shopping, and marinas that offered boat and/or Jet Ski rentals along with guided tours. We would love to return to Lands End again. great location and renovated condo! We visited LandsEnd from 7/7-7/14/12. The four of us stayed in Building 1 Room 208. This condo is completely renovated with very nice furniture. The building is right across from the pool-noise was not an issue at all! 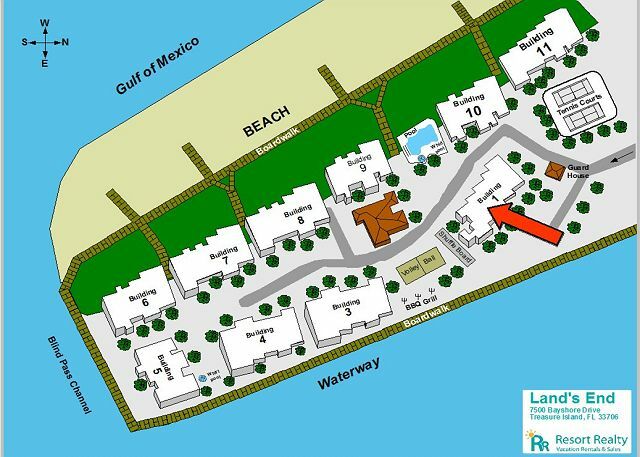 Just past the pool is the walkway to the beach. Our sons are 18 and 11 also enjoyed this location. We stayed at Lands End in 2011 in a different condo, it was nice but dated. This one was not. We'll be back and I hope we can book this one again. We loved our stay at Lands End. Our condo was wonderful and the view of the bay was beautiful. We enjoyed the boardwalk around the resort we walked it every night. We will definitely be staying in this unit again. The view, and the beach... Absolutely beautiful. Very relaxing and quiet area. We will definitely come back again next year! Will definitely return to the same unit. My wife and I felt as if we're home. Comfortable surroundings. Pleasurable vacation. Our unit was updated and the kitchen was well equipped. The room had beautiful linens and plenty of towels too. One thing that we really appreciated was the small things--paper towels, dishwashing soap, laundry detergent, etc. Loved the patio. After morning sun, was cool for rest of day. Our condo and Land's End was beautiful. This condo had everything we needed and the pictures didn't do the condo justice as it had a new bed and dresser in the master bedroom and it was decorated so pretty. I wouldn't recommend this condo for young families as it was set up more for adults. We've been coming to Florida for 9 years and this was the nicest condo and cleanest that we've stayed in. We had a wonderful time and hope we can come again next year. Very good, with minor exceptions. I would have taken very little for me to give our vacation in Lands End a "10", like soap dishes on the wash rooms, or the customary checkout time of 12noon, or the cleaning staff rapping on the door at 9.00 am. 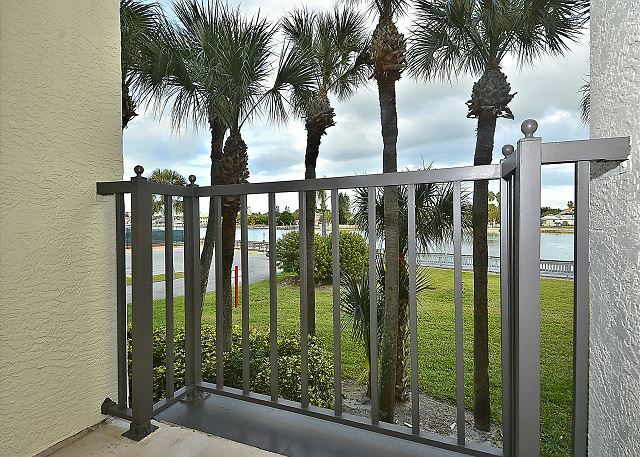 This condo has a great location, near the pool and the boardwalk, there are some bars across the water but the noise was minimal. We lucked out and had above average weather, great vacation spot, good retaurants and convenient location. Love Lands End , no better place to be !!!! This is the sixth time we have stayed at Land's End and this is the nicest condo we have stayed in. The unit is clean, well maintained and has everything you need. The only negative is that the TVs are small and there was no remote for the TV in the master bedroom. Land's End is in a great central location, the property is well maintained and not over crowded. Overall we enjoyed the condo and would definitely stay here again. We had a wonderful time at Land's End. Our unit was clean and had EVERYTHING we needed. Can't wait to go back for our next vacation!! This place was amazing. Beautiful setting. The pool was very big and generally uncrowded. The beach was clean, uncrowded, andperfect. The landscape was beautiful. The staff was helpful and friendly. My husband smokes so he would wak the grounds at night when he smoked and he would talk to all the staff. We had a problem with a clogged toilet during our stay and the staff tool care of it right away. The condo itself was amazing. It was a perfect mix of elegant and home. Very clean. Amazing view from the balcony. The sun rise was beautiful to watch every morning. There are bars across the water and you can hear their music every night, but if you closed the doors you couldnt hear anything, so it wasnt too loud. Im telling you, this place is the perfect mix of uncrowded and quiet settings and the fun busy party life. We loved it, our children (5 and 6) loved it, any my mother-in-law loved it. We loved it so much we decided to make this a yearly trip even before we left. You will love it too!! My wife and I enjoyed both our trip and accommodations very much. It is the first time we returned to Florida since our honey moon 35 years ago. Needless to say we will be returning more often. Exceptional weather, accommodations and entertainment. A few lights in the property were burnt out, sliding door and screen were hard to work, remote missing in bedroom. Very nicely decorated and updated. LIked the floorplan compared to some others we've stayed in at this complex. Great location in Land's End, right across from pool. TV's are small. Bed in master should be a king like most of the other rentals in Land's End and not the most comfortable. Overall we really enjoyed the place and would stay again. Very nice and comfortable place to stay. The Condo was spacious, well equipped and in good maintenance. Just the oven was dirty. It's a "bayfront"-condo, so you are looking towards the bay. We had nice sunrises on the balcony. Just across the water there are two restaurants with live music in the evenings that might annoy some people. Overall "Land's End" is a quiet place, some might say "too quiet". It was far away from being over-crowded. For restaurants or other places of interest a car is mandatory. The pool was big enough to have fun, but the staff sometimes seemed to be quite strict with small kids playing. The beach just in front of the condos felt a bit "untended". After a few minutes walk the beach was much better and had finer sand. It was the second time we stayed at Land's End. We definitely would recommend this place. Some condos are better than others. This Condo (1,#208) was sure a better one!